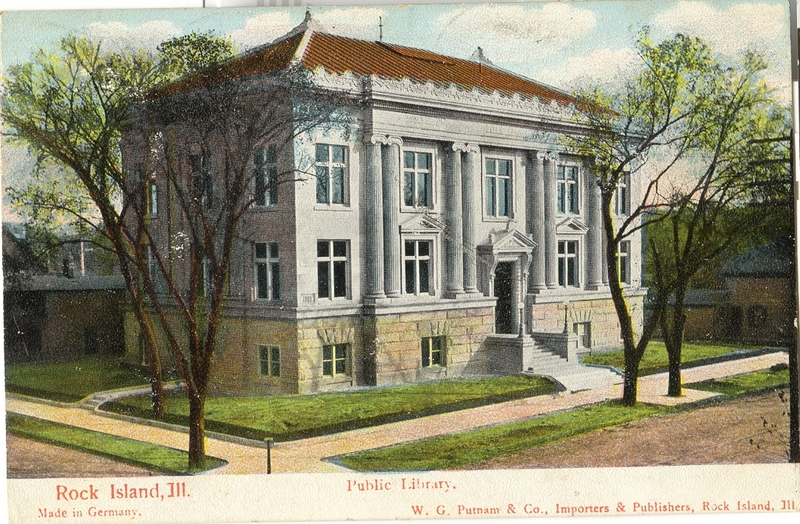 Because this postcard is a “Real Photo,” it is an accurate representation of the Rock Island Public Library, which was built in 1903. And although it’s nearly 100 years later, very few things have changed in this view of the building on the corner of 19th Street and 4th Avenue, except for the hitching post near the center of the picture, which is long gone. Our public library history begins in 1855, when Argus Editor J. B. Danforth called for a public library. Citing the popularity of reading and the high cost of books, he believed that a library would provide access to quality reading materials, rather than affordable trash novels. 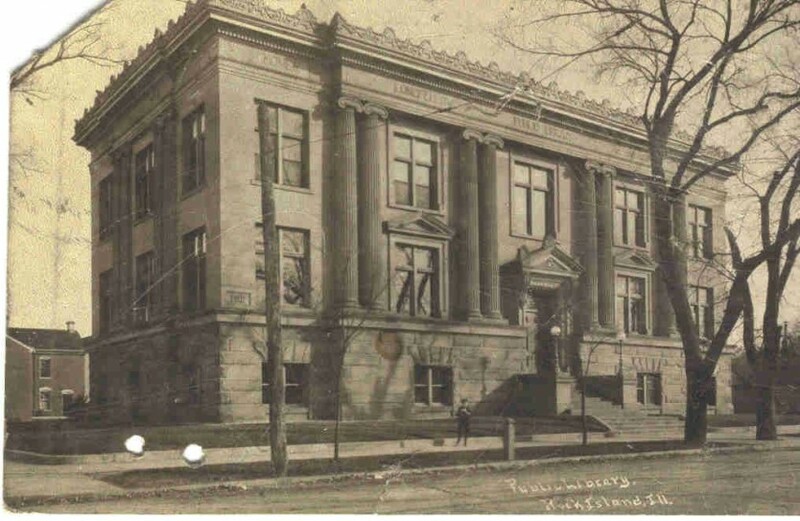 Within a few months, a “Rock Island Library and Reading Room Association” was organized. Donations from local businessmen and subscriptions from the general public enabled the first library to open in October, 1855. That first library was not public, since the city could not tax its residents for a library. Therefore access was limited to those who subscribed at a yearly fee of $3.00. This first library venture only lasted two years. When it closed, the books were stored in members’ homes. In 1865, a library was revived with the formation of another privately funded organization, the “Young Men’s Literary Association”. Although the earlier dispersed books were not all returned, gradually enough new ones were accumulated to open the new library. The association also sponsored lectures, featuring well-known speakers, from Clara Barton to Ralph Waldo Emerson. These lectures were a source of revenue that the association used to buy more books. In 1871, the Great Chicago Fire destroyed much of Chicago, including its books. As a direct result, the State of Illinois, in early 1872, authorized communities to assess taxes to provide public libraries. In Rock Island, this meant the demise of the private Young Men’s Literary Association, but it also meant that we would have a truly public library. Before the association turned over its assets to the city in favor of a new public library, it did one important thing: It hired fifteen-year-old Miss Ellen Gale as its librarian. Miss Gale remained as librarian until her retirement in 1937. Including her years with the Young Men’s Literary Association, Miss Gale was a librarian for 68 years! On November 25, 1872, Rock Island Public Library opened its doors – the very first public library in the state to do so. It was housed in one rented room, measuring only 24 x 48, in the Mitchell and Lynde Building just north of 2nd Avenue at 17th Street (now the site of Modern Woodmen Bank). During the next 25 years, library usage grew, but its space didn’t. By 1895, a new library was clearly needed. Two years later local lumber baron Frederick Weyerhaeuser helped the cause – by providing a list of names of wealthy men who, along with Weyerhaeuser, were potential benefactors for a building fund. During this same period of time, wealthy steel magnate Andrew Carnegie began subsidizing library construction across the country, ultimately funding an incredible 1679 “Carnegie Libraries,” 106 of them in Illinois. Moline’s downtown library is a Carnegie Library. Did Rock Island ask Mr. Carnegie to fund a library? Maybe – it can’t be verified. The possibly apocryphal response makes a good story anyway. Mr. Carnegie reportedly said, “Any town that has Frederick Weyerhaeuser need not ask a library from me.” Mr. Weyerhaeuser did come through. Ultimately he and others gave many dollars to enable completion of the library. In 1900 a lot at 4th Avenue and 19th Street was purchased and an architectural competition was held. The selected design was created by local firm Drack and Kerns, and the new building was constructed by contractor Collins Brothers. 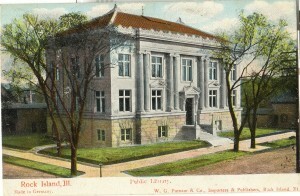 When the formal opening of the new library took place in 1903, it was called “Rock Island’s Temple of Literature.” The postcard, postmarked in 1913, shows the library sometime in its first few years. It depicts a beautiful, classically inspired stone structure that was indeed reminiscent of a Greek or Roman temple. It had a triangular frame or pediment above the doorway and over some of its windows. Two-story fluted Ionic-style columns supported a top band or “frieze” engraved with the names of a dozen famous writers. We recognize many of those names today – Longfellow, Shakespeare, and Hawthorne among them. Two others are obscure – Tegner and Bancroft. Tegner was a Swedish poet with no real connection to our community, however we did have a large number of residents of Swedish heritage. Bancroft, a statesman, historian and author, had actually visited Rock Island, albeit very briefly, in 1854. He was part of an entourage of politicians — including former president Millard Fillmore, — business leaders, and the press who arrived here on a train from Chicago in 1854, when the tracks had been finally been extended to Rock Island. The large group then immediately boarded several riverboats for a fast trip upriver to St. Paul and back. Although this picture doesn’t show details above the doorway, a 1941 Centennial Edition of the Argus shows a fishscale pattern window transom above the entrance topping glazed wooden. Since 1903, the most significant change in the historic building is the loss of the fancy roof trim, which has been missing for at least 55 years. The original wooden doors were replaced with metal ones in 1964, and the windows were replaced in 1973. Care was taken to make the new windows have the same glazing pattern as the originals, although the new ones are tinted glass rather than clear. Originally the second floor ceiling had a wonderful glass dome over a circular rotunda opening to the first floor that was encircled by a brass railing. This allowed the light to continue onto the first floor. The rotunda was removed in 1954 and the skylight was covered. Other, more minor, changes over the years included rearrangement of shelving and interior furnishings. One of the most interesting things about the library is its color – although its stone appears yellow now, it was originally gray. In fact, it was constructed of stone that was called “gray canyon stone” from a quarry in North Amherst, Ohio. The apparent inconsistency between the actual color and the stone name had intrigued local historians and architectural buffs – until the new building addition in 1985. At that time, it was found that the stone was indeed gray when it was freshly cut or protected from the elements. The current color is the result of weathering – possibly tiny amounts of iron in the stone oxidizing or rusting to a mellow gold. Over the years, the function of the library changed a great deal from Miss Gale’s day. The library became more than a “literature temple.” It became a center for all kinds of information, from books to records, movies to microfilms, even computers. Finally a decision had to be made. Could this old library building ever accommodate the continuing needs of the community? Much of the historical information in this article is taken from Roald Tweet’s history of the library, “Miss Gale’s Books,” published in 1997. Why not visit our library, read the book, and learn the rest of the story. Then wander through this beautiful and enduring building and appreciate its architecture even more. This article by Diane Oestreich is slightly modified from the original, which appeared in the Rock Island Argus and Moline Dispatch on December 30, 2001.